VISA Credit Cards are offered through the credit union. After approval, old balances from other credit cards can be transferred to your new VISA credit card. Rates range from 10 – 16%. Enroll in Visa Checkout with your Clinchfield FCU Visa card today! The free Mastercard Debit Card can be used at any location that accepts Mastercard. Funds are automatically drafted from your share draft (checking) account. The debit card can also be used as an ATM card to withdraw cash from your share or share draft account. Each card is subject to approval. 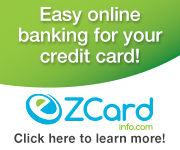 EZConnect is the credit union ATM partnership with other Northeast Tennessee Credit Unions. Transactions made at the ATMs in the EZConnect partnership are surcharge free! Click Here for an up-to-date listing of ATM locations.